Now 28 years old, the Australian Festival of Chamber Music in Townsville has once again hit the ground running. A new artistic director is in place – British pianist Kathryn Stott, taking over from Piers Lane, who ran the event for 11 years – and while she has kept the essential core of the festival’s concept, some new ideas are bringing inspiring extra dimensions aboard, stretching the boundaries of ‘chamber music’ in every direction. AFCM contains music for everything from solo violin to marimba and the Chinese sheng, from Bach to world premieres, from Lieder to tango, brought together in fresh, exciting programmes full of contrast and elan. This year’s theme is ‘Connections’ – and from the two opening evenings it was clear that this idea gives massive scope for exploratory wonders. Friday evening introduced as many as 24 of the festival’s musicians in an eclectic selection of delights. The Septet Op. 65 by Saint-Saëns for string quartet, double bass, piano and trumpet was an ideal way to introduce Norwegian trumpet star Tine Thing Helseth: with her at the core, an all-star multinational ensemble – pianist Katya Apekisheva, violinists Karen Gomyo and Grace Clifford, violist Lars Anders Tomter, cellist István Várdai and double bassist Kees Boersma happily sparked ideas off one another through this rarely-heard, high-octane work, inspired by 18th-century dance suites. In contrast, Villa-Lobos’s Bachianas Brasileiras No 5 is another strange mix of sounds, one that might be expected not to work, but turns out to hold pure poetry: here eight festival cellists were joined by soprano Siobhan Stagg, her expressive voice shimmering through the dusky, sometimes plucked, sometimes lyrical textures. Three unusual instruments – marimba (played by Claire Edwardes), sheng (a type of Chinese bagpipe, with Wu Tong) and the bandoneon (JP Jofre) offered a whole other world. The world premiere of Raqad for marimba, by Paul Stanhope, glittered with irresistible rhythms. Wu Tong’s Harmonium Mountain, with video by Clifford Ross, an Australian premiere, hypnotically mingled images of Mt Sopris in Colorado – successively deconstructed – and malleable, colourful sound. Jofre – who also performed a hypnotic, tango-inspired bandoneon solo by his fellow Argentinian Leopoldo Federico – combined all three instruments in a splendid new work, El Abralo (The Embrace). The mix of timbres was intriguing to say the least, the bandoneon drawing out the sometimes accordion-like sound of the sheng, and the marimba, though somewhat dominant in the textures, providing percussive glamour. Finally, in Chausson’s magnificent Concert for Violin, Piano and String Quartet, Stott herself fielded the ferocious piano writing in this heady whirl of post-Wagnerian ecstasy, with violinist Alexander Sitkovetsky carrying his solos like an operatic tenor and the Goldner String Quartet providing full-toned support. It’s one of the unfortunate Chausson’s masterpieces (the poor man was killed in a cycling accident in 1899, just when he was starting to receive the recognition he deserved) and deserves more outings than it usually receives. Stott, though her musical tastes are eclectic, has a special passion for fin de siècle French music, notably Fauré as well as Chausson, and this all-giving performance promises much excitement for further excursions into this delectable repertoire. Speaking of excursions, the ‘Connections’ theme turned equally stretchable in the second night’s journey-themed Governor’s Gala concert – again pushing at the boundaries of what we might have thought chamber music could be and do. 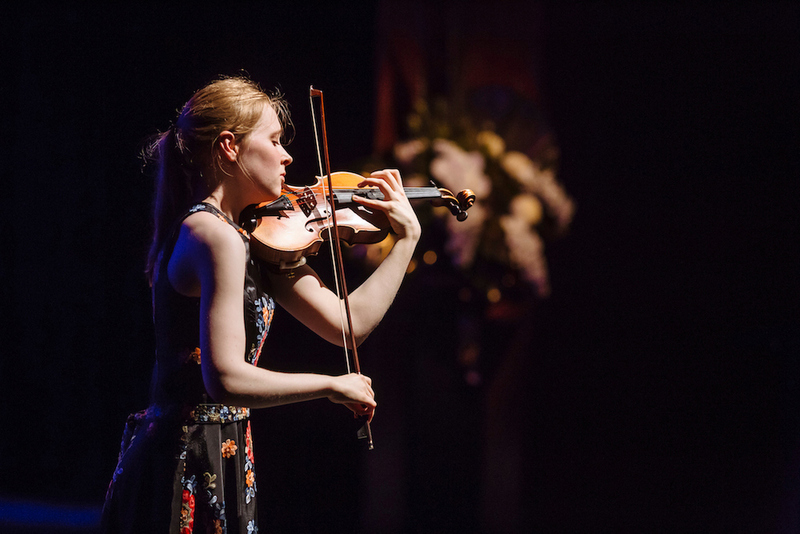 First up, a major young Australian talent was in the spotlight: 20-year-old violinist Grace Clifford. The festival has in residence the award-winning Chinese composer Julian Yu, who created his Passacaglia after Biber in tribute to the baroque master’s works for violin. Taking the four-note ground bass of Biber’s own Passacaglia, Yu spins an intricate and substantial solo work, growing to great heights from one simple idea. Clifford, a former winner of the ABC Young Performer of the Year Award, rose to all its many challenges, performing (from memory) with a sense of deep spiritual and intellectual understanding. I’ll follow her career with much excitement. Next, pianists Timothy Young and Katya Apekisheva joined forces for Ravel’s Rapsodie espagnole – though more often heard on full orchestra, it loses not a jot when transferred to piano duet, especially since this expert duo conjured Ravel’s mysterious heat-hazes and rapt atmospheres with their touch alone, in a matter of moments. Roderick Williams, the British baritone, is one artist of whom audiences here – and indeed everywhere – just can’t get enough, and for good reason. He and pianist Daniel de Borah offered Vaughan Williams’s Songs of Travel, a song cycle on poems by Robert Louis Stevenson in which travel becomes a metaphor for a journey through life; they targeted its emotional heart, profoundly sincere and direct, the melodies streamlined and Williams’s burnished voice beautifully supported by de Borah’s elegant pianism. Williams’s diction is clear as a bell, and he infuses his rich and flexible tone with every subtle shade of emotion in the text. Finally came Tchaikovsky’s Souvenir de Florence – and here a multinational team of six top-notch performers gave this veritable symphony for string sextet all they’d got. Violinists Alexander Sitkovetsky and Karen Gomyo, violists Lars Anders Tomter and Tobias Breiner and cellists István Várdai and Guy Johnston may not have worked together before en masse, but here, in the ‘zone’ of shared world-class music-making, these musicians could simply meet, match and raise the roof. And perhaps this is the point of connection that the AFCM is really all about. The Australian Festival of Chamber Music runs at venues around Townsville until August 5. Jessica Duchen is a British novelist and classical music writer. Her journalism has appeared in The Independent, The Guardian and The Sunday Times, as well as BBC Music Magazine, Opera News and numerous other journals. She will narrate the world premiere of her new work Being Mrs Bach at the Australian Festival of Chamber Music on August 1.